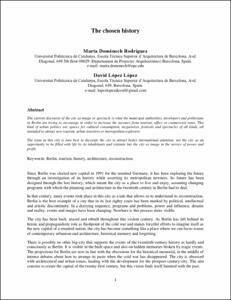 Domenech-Rodriguez, Marta; López López, D.
The current discourse of the city as image or spectacle is what the municipal authorities, developers and politicians in Berlin are trying to encourage in order to increase the incomes from tourism, office or commercial rents. This kind of urban politics are spaces for cultural consumption, megastores, festivals and spectacles of all kinds, all intended to attract new tourism, urban travelers or metropolitan explorers. The issue in this city is how best to decorate the city to attract better international attention: not the city as an opportunity to be filled with life by its inhabitants and visitants but the city as image in the service of power and profit. Domènech Rodríguez, Marta; López López, David. The chosen history. A: Conference of the International Forum on Urbanism. "6th Conference of the International Forum on Urbanism (IFoU): TOURBANISM, Barcelona, 25-27 gener". Barcelona: IFoU, 2012, p. 1-10.